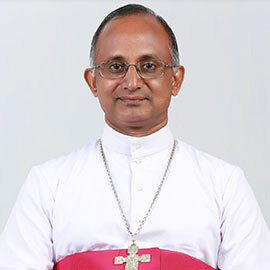 Bishop Mar George Madathikandathil, son of Mathew and Aleykutty, was born on May 9, 1956. He hails from the parish of St. Sebastian's, Purapuzha, of the Eparchy of Kothamangalam. After having his preliminary studies at Govt. L.P School, Purapuzha, St. Sebastian's U.P School, Purapuzha and St. Augustine's High School, Karimkunnam, he joined the St. Joseph's Minor Seminary, Kothamangalam on July 5, 1971 in answer to the call of the Lord to priesthood. After his studies there, he was sent to St. Joseph's Pontifical Seminary, Carmelgiri, Alwaye for his philosophical training and completed his theological training at St. Joseph's Pontifical Seminary, Mangalapuzha, Alwaye. Bishop Mar George Punnakottil, successor to Mar Matthew Pothanamuzhi, ordained him priest on December 23, 1980 at Purapuzha. His priestly ministry started with the appointment as the assistant warden of Nirmala High School, Muvattupuzha (05/01/1981- 15/05/1981) and then as assistant parish priest at the Cathedral(15/05/1981- 18/03/1982), Arakuzha (18/03/1982- 19/03/1983), and Paingottoor (25/03/1983- 28/08/1984) parishes. When he was assistant at Paingottor parish, he also had the charge of the parish priest of Punnamattam. In 1984, he was sent for higher studies and in 1989 he secured from the Oriental Institute in Rome his Doctorate in Canon Law on the subject: "The Catholic Bishops' Conference of India (CBCI): An Inter-ecclesial Assembly". As he returned, he was appointed the parish priest in charge ofThennathoor, Neriamangalam, and Bethel successively. He was also the notary of the Eparchial Tribunal and later served as the Defender of Bond and continued as an Eparchial Judge. He was appointed as the first resident parish priest of Njarakkad (23/04/1990 to 15/05/1993). God made another turn in his life by appointing him as professor in St. Thomas Apostolic Seminary, Vadavathoor, Kottayam. He served the seminary as professor, Vice-Rector and Rector for a long span of 17 years. His simplicity and humble words resembled the human face of Jesus, and the seminarians got inspiration from him. He was patient enough to hear and efficient enough to guide, which helped in the formation of many loving priests for the Church. After his term of Rectorship in the seminary he was appointed as the parish priest of St. Mary's Forane Church, Arakuzha where he truly lived as a father of the people of God. His words and deeds were inspired by prayer and communion with God, especially with Our Lady. His readiness to give ear to the sorrows of the oppressed and the needy made him a real priest of Christ.